.torrent is a extension used for BitTorrent file format. Torrent tracker, is a software tool that tracks the information of peers and seeds for a torrent file. In simple words records the statistics of the torrent file across the distributed network. The main purpose of its usage is it helps the torrent clients like bittorrent, utorrent, qTorrent etc to communicate with each other such that it can find more peers and seeds enabling the user to download the relevant torrent file(let it be movies,songs,videos,images,documents or anything) quickly. One must understand that, more the number of peers and seeds for a torrent file then more quicker the file downloads. Even if you have a ground breaking internet speed and less peer & seeds, it’s obvious the rate at which the file downloads will be less. BitTorrent is a peer-to-peer protocol widely used for file sharing. The major pro in a P2P protocol is that, since it is based on a distributed network , we can fetch the files from original person who shared the files and grab small chunks of data from other downloaders who have downloaded same files which in turn increases the rate of download. BitTorrent is one among the most commonly used files sharing protocol for transferring large sized files in a distributed network of servers/ peers rather than residing in a centralized server. Basically it is an server, which contacts the peers (basically the devices holding the torrent file connected in a network) and transfers the data between them using BitTorrent protocol (P2P protocol). The peer sends a message to the torrent tracker to register its interest in a torrent file. The torrent tracker replies back with a list of other peers who have previously expressed interest on the torrent file.Then the peer connects directly to each of the peers it received from the torrent tracker. Torrent trackers can be private or public. Torrent Tracker lists are very useful to speed up and increase torrent download speed. 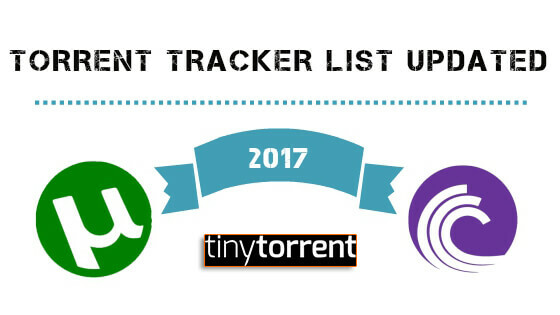 Below are the list of torrent tracker list which you can add to your torrent clients like utorrent, qBittorrent, deluge etc.., which can enhance your download speeds.